No matter what language is used in the classroom, manipulatives convey the essential underpinning of mathematical concepts. Teacher-friendly scripted lesson plans increase teachers' confidence and background knowledge of math concepts. Oral and written communication between students and between teacher and student are integrated in all activities. 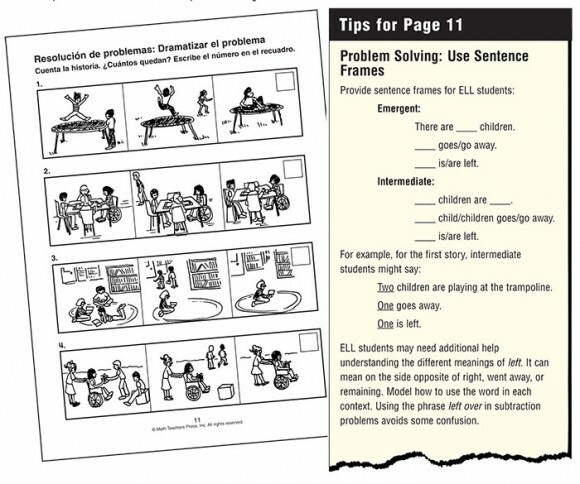 These include math glossaries in English (and Spanish for Spanish Resource Programs), vocabulary cards, real-world examples, and small group activities to encourage discussion, explanation, and writing word problems. Students using manipulatives and related hands-on strategies develop understanding of math concepts that can then be used in successful problem solving. Spectacular Results in ELL Programs! The Minnesota Migrant Program has used Moving with Math for three years in a row. Results just keep getting better! Arlington ISD in Texas used Moving with Math for their 1st and 2nd graders in a supportive math program for ELL students. The percent of increase in mean scores was 24%. The average gain for each student was 43%!